•	2” Thick, 12” Wide 20 oz. Reversible Vinyl Safety Pad Pad Color is GREEN. Othe colors are available for an Up-Charge cost. Contact us for a color change. Bouncing has never been so fun! The Standard 9’x15’ rectangle trampoline is perfect for the family with a narrow back yard! Reap the benefits of rebounding! Benefits include: HAPPY FACES! FAMILY FUN TOGETHER, A STRONGER HEART, a full aerobic cardiovascular and strength workout, PROMOTES WEIGHT LOSS, increases bone density while taking the stress off of weight bearing joints. A great way to get a workout and have a blast doing it! 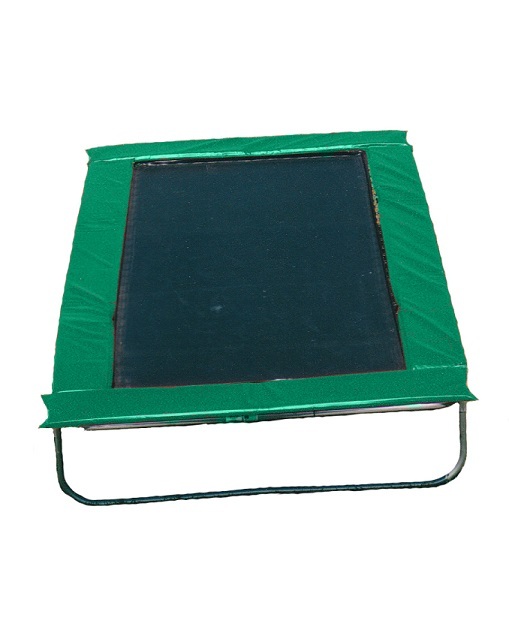 The Standard rectangle outdoor trampoline features a rugged, galvanized construction with a Permatron mat and extra-wide frame pads to cover springs, & frame. This trampoline is the safest on the market and surpasses all ASTM requirements. Made in the USA! Safety enclosures are available for this model. FREE SHIPPING IN CONTINENTAL U.S.!!! Buy directly from the manufacturer for top notch service!! FREE SHIPPING IN THE CONTIGUOUS USA! *Some shipping charges may apply due to unusual circumstances. *Pad Color is GREEN. Othe colors are available for a small Up-Charge cost. Contact us for a color change. *Assembly available in the following areas: Houston, Austin, San Antonio, Victoria and surrounding areas. We also can recomend assembly personel for your area. Call 1-800-700-5887 for pricing.